Now is the time for sour cherries in the green markets of New York, but blink and they'll be gone: they last scarcely longer than a solstice. I spied some at the Wilklow Orchards booth at Borough Hall on Tuesday and greedily loaded up, actually capsizing the stroller in the process (and I dug out that stroller for the sole purpose of hauling fruit). The guy said next week will see the last of them, so if you live around here, carpe diem! Cherries of any variety are great American crowd pleasers, but the sour ones, petite and luminescent, pack an extra punch that brightens up just about any baked good they grace: we love 'em in clafoutis and pies, tarts and financiers. Once you add sugar, some kind of alchemy happens, and you create tangy, sweet magic. I hesitate to admit this, but I think the reason I go so wild for the flavor is that it so strongly evokes Jolly Ranchers, a childhood favorite. Today, the mercury's headed up into the 90's, so I'm making a sour cherry granita. Here's my easy non-recipe: just throw a bunch of pitted and stemmed cherries into a blender with a little water, some sugar, and a few drops of kirsch. Whir on the highest setting for a long, long time, stopping to scrape down the sides occasionally. Taste and play, adding sugar bit by bit until the flavors fall into balance. Just don't pour in too much water–it's better to hold back and add it as needed. Ditto with the kirsch, which should not announce itself. Once cherries are pureed smooth, choose a small tray or casserole dish and pour them in to just cover the bottom. Lay the tray in a flat, stable place in your freezer and let it do its thing. But you must do your part, too: rake a fork across the puree every 30 minutes to break up large crystals and ice floes. After about 4 or 5 hours you should get an icy, sorbet-like consistency. It's perfection with sweetened, whipped cream. and sugersnaps, treasure it, and never let it go. So I decided to put up a bunch of these tart little rubies for the winter, when we'll be needing their warmth and sparkle. I love the phrase "putting up," so redolent of homeliness, ritual, and optimism. I realize, though, that in going through the motions of preserving I'm actually admitting the unthinkable: that summer will end and we'll soon be bled by the New York City winter. Something stronger than mere jam will be needed to cope with that reality, so this year I've brandied and squirreled away some sour cherries–a surprisingly easy process, much simpler than the necessary tedium of full-on water canning, which has always struck me as a bit obsessive-compulsive. Since such a high quantity of booze is involved here, you can bet any microbe that even thought of setting up camp in your jars will flee in terror. I adapted my recipe from those featured in Judy Rodgers' Zuni Café Cookbook and Alice Waters' Chez Panisse Fruit. They are similar; both specify leaving the cherries whole, pits left in for flavor–but Rodgers advises using a good-quality, inexpensive brandy, while Waters insists on "the best brandy you can afford". I took the middle road and, after much hand-wringing at the liquor store, purchased the bottle above. It set me back about $16, and I still have a ton left over for whatever other fruits I want to drown in it as summer shines on. Even though neither recipe calls for it, I always sterilize my jars, just in case. I'm mildly obsessed with these pretty Italian vessels; the brand is Quattro Stagioni and each holds about 5 fluid ounces; the recipe below filled five of them. 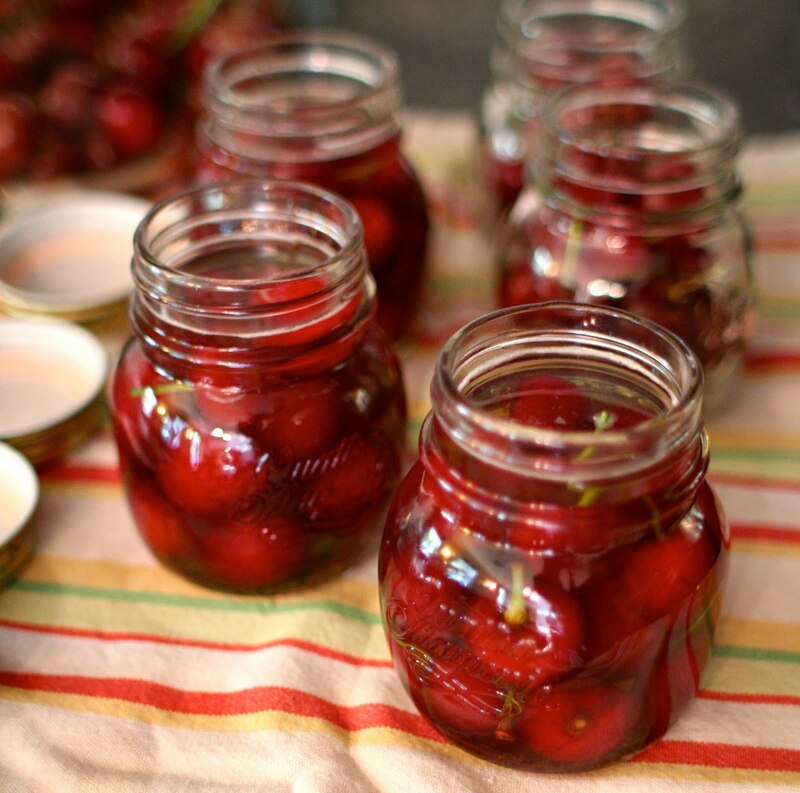 Be choosy with your fruit and, er, cherry pick at the market so your jars glow with only bruise- and blemish-free beauties. Update: We enjoyed these the whole year through, and now it's time to put by some more! They are very potent. Over the winter, we filled pretty little bowls with the "cherry bombs" and offered them during holiday celebrations, with ample warning beforehand; they disappeared quickly. They also made a delicious foundation for a pan sauce with sauteed duck breasts, and heated up with some butter for serving over ice cream. The alcohol never quite cooks out of them, though, so don't think of this as a G-rated dessert. Sterilize jars: boil gently in a large pot of water for a few minutes, then set out on a clean towel to dry. Simmer lids to soften rubber seals. Once jars are cooled and relatively dry, pack cherries into them carefully, filling to just below "shoulders" of jars. Dissolve sugar into brandy by heating gently in a pot on the stove, dribbling in a little bit of water. Whisk together. Using a spouted measuring cup or pitcher, pour brandy into jars until it just covers the cherries (should reach just to bottom of rim). Tap each one to release air bubbles, then screw lids on tightly. Put in a cool, dark place, occasionally turning jars upside down to re-distribute any sugar crystals that settle out. Leave them there for about a month to allow the flavors to meld, then refrigerate for up to a year. To enjoy, Rodgers recommends leaving cherries out for a bit to disperse alcohol, if you are serving them raw. Or, pit and stem them and cook, sautéing or roasting briefly for game dishes (picture these with duck in the fall), or sautéing in butter with a bit of their syrup and serving over ice cream. They would be dreamy with creme brûlée and other custard desserts, equally nice with cheese or pâté–or as grown-up maraschino cherries. You probably want to hide these from the kids. Cherry pick...ha. These look delish. We had a huge cherry tree in our yard growing up. One of my best summer childhood memories was picking the fruit and making pies. I guess that's why I love cherry pie the best. 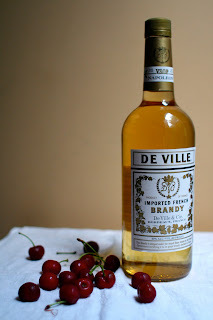 Just found a similar recipe from Elizabeth David, along with a note to use decent brandy: "Do not, as Cassell's Dictionary of Cookery remarks, 'make the mistake of supposing that the fruit and sugar will make bad spirit pass for good'." Hi, Claiborne. Thanks so much for pointing me in the direction of this post. Eli goes cherry crazy every summer. I can't wait to preserve some this season so that we can enjoy them all winter long. Also, I love those jars. Thank you for the jar recommendation! I hope to be canning and preserving starting this summer and have been on the hunt for attractive (and effective) jars!